Black Sabbath is an English heavy metal band formed in 1968 in Birmingham, West Midlands, England, United Kingdom, originally comprising Ozzy Osbourne (vocals), Tony Iommi (guitar), Geezer Butler (bass), and Bill Ward (drums). In the early 1970s they were the first to pair heavily distorted, sonically dissonant blues-rock at slow speeds with lyrics about drugs, mental pain, and abominations of war, thus giving birth to generations of metal bands that followed in their wake. They are often credited with creating the heavy metalgenre as well as the doom metal genre. Black Sabbath was formed in Aston, a poor district of Birmingham damaged by bombing during World War II, under the name Polka Tulk Blues Band (soon shortened to “Polka Tulk”), later Earth. 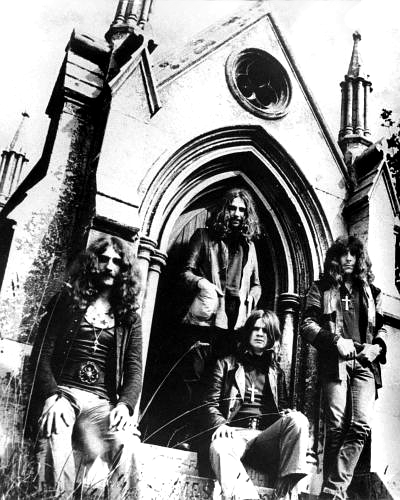 Initially a blues-rock band, Earth moved in a darker direction when their bassist, Geezer Butler, a fan of the black magic novels of Dennis Wheatley, wrote lyrics for an occult-themed song titled “Black Sabbath” (the song name was inspired by a 1963 Mario Bava film), and Tony Iommi wrote a riff based on the tritone, sometimes called “Diabolus en Musica” (“the Devil in Music”). In their Last Supper concert film, the band stated that the song is based on an experience Geezer had one night when he saw a black object at the end of his bed and noticed the next day that an occult book Ozzy had given him was missing. When the band found themselves being confused with another local band called Earth, they adopted the song title as their new name. As the band evolved, they added more European folk elements and gothic flourishes to their sound, which was unlike any other group during their time. Their lyrics dealt with darker issues than most conventional rock. Towards the late 1960s, bands were into the peace movement and the dying hippie culture, whilst Sabbath chose to distinguish themselves by dealing with heavier issues; the occult, war, apocalypse, drugs, and gothic storytelling. Their music also conveyed a sense of anger and anti-establishment, the likes of which had not been heard before. It was this mix of dark lyrical themes and a slower, ominous sound that made Black Sabbath a significant element in the genre that would later be known as heavy metal. Despite their doom-laden image, much of the group’s early material featured acoustic guitars, piano, symphony orchestras, keyboards, and even horns. After the band’s first four albums, the group became increasingly psychedelic, experimental, and progressive, leaving much of their dark metal roots behind. The last two Osbourne-fronted albums, Technical Ecstasy (1976) and Never Say Die! (1978) left a lot of fans dissatisfied with the band, as drugs and alcohol abuse began to take its toll on each member. Osbourne was fired in 1978 for becoming increasingly unstable and unwilling to work with the material that, by this time, Tony Iommi was writing more or less entirely himself. Osbourne started a highly successful solo career in 1980. In 1979 Tony Iommi recruited former Rainbow members; singer Ronnie James Dio and bassist Craig Gruber. Gruber was recruited because Geezer Butler was unhappy with Osbourne’s departure, and was rumoured to have quit the band. Gruber was dismissed and Geezer rejoined. Black Sabbath’s first album with Dio, Heaven and Hell, proved to be a success, and saw the band’s highest American charting since 1975’s Sabotage. It was on this tour that Dio popularised the “devil horns” hand gesture, which has since become a symbol of heavy metal music in general. The album also marked the inclusion of Quartz’s guitarist-turned-keyboardist Geoff Nicholls (Nicholls has not been consistently credited as an official member, and has always been forced to play live shows from off stage (except on the Seventh Star tour in 1986 where he played on stage) supposedly for aesthetic reasons, but he has co-written many songs and has stayed with Black Sabbath through all subsequent incarnations, until he finally left in 2004. Adam Wakeman, son of Rick Wakeman, took over in 2005). Also during the tour, drummer Bill Ward quit the band for personal reasons (both his parents died within a rather short period, and Ward was struggling with alcoholism and other addictions). Drummer Vinny Appice joined to complete the tour and then record the next album Mob Rules, in which an early version of the title track appeared in the film Heavy Metal. Ronnie James Dio and drummer Vinny Appice left the band after supposed disputes concerning the mixing of the live album Live Evil, and pursued a solo career together. Black Sabbath re-enlisted drummer Bill Ward, and, along with ex-Deep Purple singer Ian Gillan(who agreed to join the band whilst heavily intoxicated), released Born Again in 1983. It reached a respectable number two in the U.K. music charts, a success not seen sinceSabbath Bloody Sabbath, ten years previously. However, the album was not received particularly fondly by critics or fans alike, and not even by singer Ian Gillan. The tour that followed was to provide a wealth of material for the spoof documentary on rock ‘n’ roll culture, Spinal Tap. Drummer Bill Ward was still recovering from poor health and so did not tour for the Born Again album. Instead, fellow Brummie Bev Bevan, formerly of The Moveand The Electric Light Orchestra, took to the drumstool for the tour obligations. Once the tour was over, Ian Gillan left the band to rejoin his Mk.2 Deep Purple band mates. From here on the line-ups of Black Sabbath changed relentlessly, with Tony Iommi being the only constant member. Between 1986 and 1995 Black Sabbath released 7 studio albums and one live album, including a reunion album with the Mob Rules line-up (1992’sDehumanizer). In 1997 the original line-up reunited for a proper world tour (as opposed to the one-off Live Aid in 1985, and Costa Mesa gigs on Ozzy’s “Farewell” tour in 1992) and have toured on and off since. Currently the Mob Rules line-up have reunited once more under the banner Heaven & Helland toured the world in 2007, promoting Black Sabbath - The Best of: The Dio Yearsfeaturing three new tracks and a release of Black Sabbath Live at the Hammersmith Odeon, 1982. They released a live CD/DVD and released a studio album of entirely new songs in April 2009. VH1’s “100 Greatest Artists of Hard Rock” ranked them second, behind Led Zeppelin. They were inducted into the Rock ‘n’ Roll Hall of Fame and the UK Music Hall of Fame in 2006. Aside from being arguably the first heavy metal band, Black Sabbath also directly influenced many later metal sub-genres with their sound and imagery. Examples can be seen especially in doom metal and stoner metal, which are directly descended from Black Sabbath’s original sound, with songs such as “Black Sabbath”, “Into The Void”, “Hand Of Doom” and others showcasing Black Sabbath’s staple doom sound. Other sub-genres influenced by Sabbath’s sound also include speed metal and thrash metal on the opposite side, “Paranoid” and “Symptom Of The Universe” are considered early examples of these genres. Black Sabbath’s lyrical use of hell, death, Satan and horror as imagery also greatly influenced heavy metal, as these themes are prevalent in nearly all heavy metal sub-genres. In December 2008 Iommi filed a lawsuit against merchandise company LiveNation for continuing to use the Black Sabbath name and Tony Iommi’s likeness to sell merchandise, even after their contract had ended. On May 26, 2009 Osbourne filed suit in a federal court in New York against Iommi alleging that he illegally claimed the band name. Iommi noted that he has been the only band member for the full forty one years of the band, and that his bandmates relinquished their rights to the name in the 1980s, therefore claiming more rights to the name of the band. Although, in the suit, Osbourne is seeking 50% ownership of the trademark, he has said that he hopes the proceedings will lead to equal ownership among the four original members.